This needle has a nickel finish, same as a regular home sewing machine needle. Slightly rounded point. Regular point. This needle is designed for use in electronic multi-purpose sergers that do the overlock, cover, safety, and mock safety stitches. Not suitable for use in normal home sewing machines or embroidery machines. Machines should specify ELX705 system. Regular finish. Needles have a groove on the front and back sides of the blade to reduce skipped stitches. The second long groove is necessary to create chain stitches like overlock or coverlock stitches. 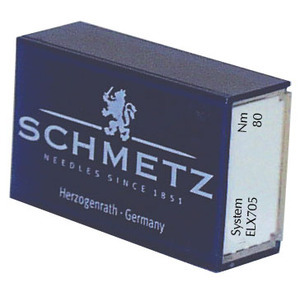 ELx705, have increased strength due to a reinforced blade leading to less needle breakage and straighter stitches. ELx705, has a slightly rounded point for universal use. Be sure to check your owner's manual! A 25 year customer, I have always found this company excellent in product and service. Thank you for the prompt shipment, I was unable to purchase the overtlocker needles in Australia, so was very pleased when I found I could obtain the product on line using paypal. Thank you for being so prompt. I will shop with you again. I just wish I could buy all my sewing equipment from AllBrands. I always go to your site for supplies. This was my first order and I will be shopping with you again. I am very impressed with the speed of service that I received from AllBrands--both boxes of needles were here within a few days. WOW I will be back to shop to keep feeding my machines their necessary notions!